100 % NZ Extra Virgin Olive Oil hand-picked by family and pressed locally. Pukininny Olives is a boutique olive grove situated in sunny Mangonui in the Far North, an area well known for the growing and production of high quality olive oils. We are a family business and pride ourselves on growing healthy trees in order to produce high quality oil. VERDALE J5 - a cultivar possibly originating from the South of France. In circa 1893 the original trees were brought to the Far North by Frank Lisle and planted at Whangape. In the early 1900's hybrids of these trees were produced locally and the J5 hybrid, which is accredited to Milton Johnson, is only grown in the Northland regions of NZ. The olives produce an oil renowned for it's distinctive full flavour appreciated by the European palette. FRANTOIO - originating from Tuscany this oil is buttery and smooth to the taste and is considered to be a premier tree for producing Extra Virgin Olive Oil (EVOO). LECCINO - originating from Tuscany the tree produces full bodied olives which produce a high ratio of oil that is mildly fruity and delicate. 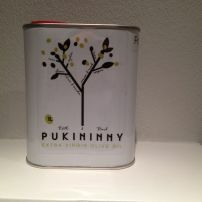 Pukininny Extra Virgin Olive Oil is sold in traditional 1 litre EVOO grade tins. This method keeps the oil free from light and is a more economical method for us to package and post our oil. Premium quality EVOO in 250ml bottles costs between $11-$15 equating to $44-$60 per litre so Pukininny Extra Virgin Olive Oil at $29 plus postage and packaging ($5.50 NZ wide), makes for excellent value when purchased on-line. 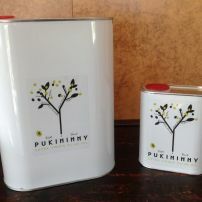 Pukininny Olives have introduced the 4 Litre EVOO grade tin. This size is an excellent alternative for restaurants and high users and at an affordable price of only $110 incl GST plus postage and packaging ($9.50 NI & $13.50 SI). Payment Options: We have the facility to pay on-line via PAYPAL, however you can ORDER DIRECT by sending an email to keithhenderson1151@gmail.com. I will send you an invoice with our bank account details for direct credit if this is the method you prefer. We can also sell in bulk 20 litre containers and 200 litre drums. Please enquire for bulk purchase pricing and cartage.